One of the top female country stars of the 1990s, Loretta Lynn Morgan has fashioned a persona and an approach to her music that combine glamor with attention to the con-cerns of everyday life. Her delivery is often dramatic and torrid, yet has a disarming directness. The fifth child of Grand Ole Opry star George Morgan, Lorrie grew up watching her father's performances from backstage. She made her own Opry debut at age thir-teen and was working nightclubs when she was fifteen. She became an Opry member in 1984. After years of performing in Nashville clubs, singing on television, recording for at least four record labels (Columbia, Four Star, ABC/Hickory, and MCA) with little success, and opening shows on the road for many other performers, Morgan was signed to RCA in 1987. A year earlier she had married Keith Whitley, and in 1989 Morgan was touring Alaska to promote what would become her breakthrough RCA single, "Dear Me," when Whitley drank himself to death. "Dear Me" was followed by three other Top Ten singles from her debut album, Leave the Light On, including the #1 hit "Five Minutes." In addition, Morgan added new vocals to an older Whitley recording of " 'Til a Tear Becomes a Rose," creating a duet performance that was recognized as the CMA Vocal Event of the Year in 1990. 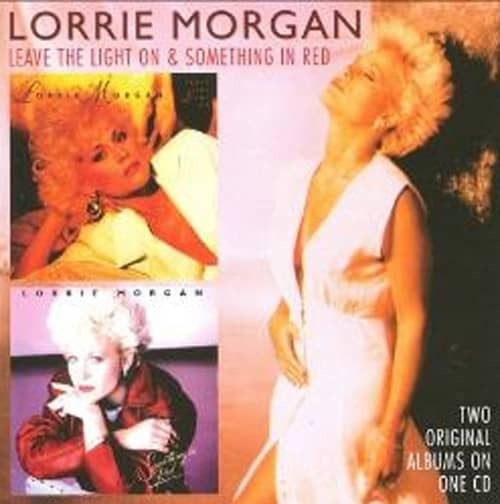 Something in Red (1991) was an even stronger album, be-coming Morgan's second gold record. Uptempo numbers such as "We Both Walk" were combined with the memo-rable "Something in Red" and a powerful remake of GEORGE JONES'S "A Picture of Me (Without You)." After a switch from RCA to the BNA label, her album Watch Mewas released in 1992. It included "What Part of No," which became another #1 hit. In 1993 Morgan made her acting debut in the TNN movie 'Proudheart', a slice-of-life story of a working-class mother. A 1994 TV series featuring Morgan as a police officer was not picked up by a network. In 1995 she appeared in a second film, The Stranger Beside Me. "I Didn't Know My Own Strength" (1995), an anthem of independence, could be read as describing Morgan's feelings about her personal life. Four marriages and numerous high-profile romances have made her tumultuous love life a constant source of interest to fans. In 1996, in support of her album 'Greater Need', Morgan toured with Pam Tillis and Carlene Carter. Kundenbewertungen für "Leave The Light On (89) - Something In Red (91)"